The Jantar Mantar monument is in Jaipur, Rajasthan is one of key attractions for tourists coming from different parts of the world. It is royal observatory built by Rajput king Maharaja Sawai Jai Singh II, and completed in 1734 CE. The king also built Jantar Mantar in New Delhi, Varanasi, Mathura, and Ujjain. It consists of nineteen architectural astronomical instruments for measuring time, predicting solar & lunar eclipses, ascertaining the declinations of planets, tracking locations of major stars as the earth moves around the sun, and determining the celestial altitudes and related ephemerides. It also features the world’s largest stone sundial. It has been declared as a UNESCO World Heritage Site and has been one of the most prominent and sought after tourist attractions on Jaipur sightseeing tour in Rajasthan, India. Situated near the City Palace Complex and the Hawa Mahal of Jaipur, the Jantar Mantar monument masonry, stone and brass instruments which were built according to astronomy and instrument design principles of ancient Hindu Sanskrit texts. All nineteen architectural astronomical instruments in the grand Jantar Mantar monument are arranged in alphabetical orders. The names of instruments are Chakra Yantra, Dakshin Bhitti Yantra, Digamsha Yantra, Disha Yantra, Dhruva Darshak Pattika, Jai Prakash Yantra, Kapali Yantra, Kanali Yantra, Kranti Vritta Yantra, Laghu Samrat Yantra, Misra Yantra, Nadi Valaya Yantra, Palbha Yantra, Rama Yantra, Rashi Valaya Yantra, Shastansh Yantra, Unnatasha Yantra, Vrihat Samrat Yantra, and Yantra Raj Yantra. The Jantar Mantar Royal Observatory Monument is managed under the Archeological Sites and Monuments Act of Rajasthan since 1961, and protected as a National Monument of Rajasthan since 1968. This royal observatory and grand monument plays a vital role in Jaipur tourism attracting tourists from all over the world. 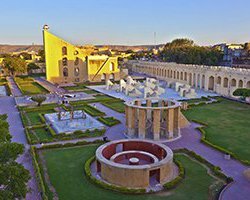 Your Jaipur sightseeing tour is incomplete without visiting the Jantar Mantar monument. So, don’t miss the opportunity to visit this historical monument and royal observatory to explore different architectural astronomical instruments.